I am a napper; I love sleep, and getting a lot of it. As a child, I was always happy to get my daily naps in, and nothing has changed now that I'm a young adult. Naps help me get through the day, since I often am unable to get a full eight hours in every night. Many people don't nap, and don't see why others are so passionate about them, but I'm here to tell you all the reasons why you should be napping everyday! Trust me, it does mean you are lazy whatsoever. I also made a video on my YouTube channel about my nap routine, so you can check it out down below! Napping keeps you rested throughout the day. Even though I try to get eight hours of sleep every night, it's really hard to do when you have classes, work, or anything else really. Honestly, even when I do get at least eight hours of sleep, I still feel tired the next day. Taking a nap helps me feel rested when I get into the afternoon slump, and feel lethargic, and can't get anything done. Even a quick fifteen or twenty minute nap helps! While you might think coffee is the only thing that can do this, a good nap can help you feel just as awake and alert! Allowing your body to rest for a little bit helps your mind just as much, and you'll feel so much more energized afterwards. Napping allows your body to basically sort through all of the chemicals in your brain, just as it does when you sleep at night, so after you nap, your serotonin (the happy chemical in your brain) increases. This means that you are happy and in a much better mood than before you napped! It boosts and restores your senses. You know the feeling when you are worn out, and just generally feel like a bump on a log? Napping takes care of that, and allows you to restore your senses after you have had a long morning, or are just feeling generally lethargic. This can be really helpful so your reaction times to potentially hazard events is much better. Naps improve your ability to learn. There has been scientific evidence that napping keeps your brain working harder and longer all day, resulting in an increased ability to learn. This is especially beneficial for students! I mean hey, I'll take any legitimate excuse to nap that I can. Naps make you more creative. For some reason, napping increases the activity in the right side of your brain, which is the side that is in control of your creativity. 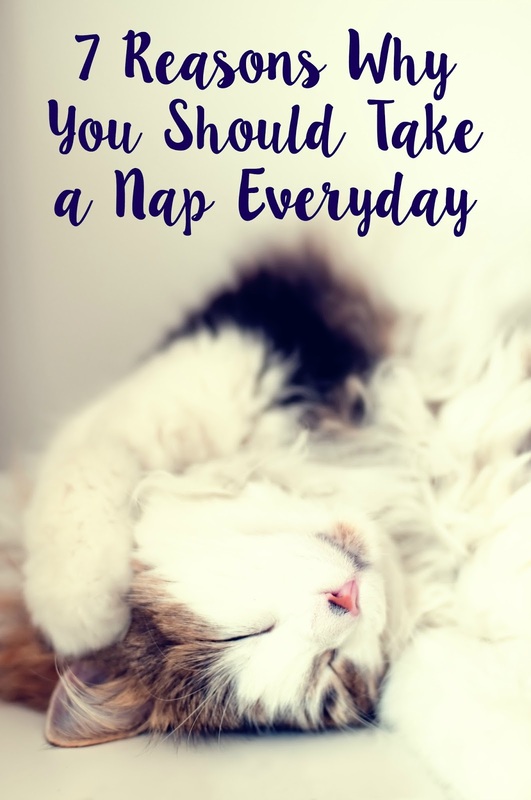 By napping, you are able to increase the activity on that side, and you will wake up feeling inspired, and with solutions to problems that you can't figure out! They allow you to de-stress. This is one of the number one reasons why I nap, because I am a big ball of stress throughout the week. With classes, work, working out, and extracurricular activities, I feel like I hardly have anytime to breath, let alone deal with problems. By taking at least twenty minutes out of my day to just lie down and get some shut eye, I feel like I can get a grip around all of the stress I have. Alright, those are the seven reasons why you should nap every single day! I really hope this helped, and convinced some of you to start getting in quick naps during the week, because it really does help. You are so right on target with this nap thing. I don't know why more people do it! Honestly, when I have the slightest stress I'm off to the sofa to cuddle up in a supersoft blankie and when I get back up, usually between 30-60 minutes, I'm totally back on track. This is a great post, love it! I agree - that is one of the best ways to de-stress! :) Thanks for reading! I love to nap. But only with my special blanket for this purpose :) Thank you for sharing this. I've never been able to nap, and it drives me crazy. I wish I could!